a convenient time and location. I accept e-docs. Bonded and covered by Error & Omissions Policy. 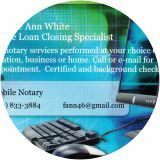 property loans, adoption papers, child relinquishment documents and witness to over phone hearing proceedings, assignment of trust documents, filing of deeds, etc. with the county clerk of the court, property location verification. VA, FHA, or conventional refinance closings.